For my thesis exhibition I will be showing a total of seven necklaces. My exhibition space in the museum is the left side of the North Gallery, spanning two walls in an L-formation. I chose this space for its intimacy and the color of the walls, which unlike the rest of the museum are painted grey. I will be showing my work in two ways: draped over busts that are suspended from the wall and on live models. 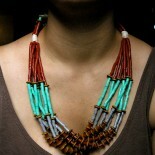 The nature of my work wavers between the realm of art objects and wearable adornment. By pairing live models with a contemporary take on traditional jewelry display I can portray both aspects of the work. Through presentation I have the opportunity to highlight the differences between the didactic qualities of mobile and static.The pieces themselves, being inanimate objects are not inherently mobile but rather constructed in a way that allows the form beneath them to dictate their potential movement. In contrast, hanging work from busts on the walls prevents them from having any motion and suggests that they are to be viewed from a safe distance, without physical interaction. There will be four busts in total, cast in concrete from molds I will make of triangulated digital models of the human body. The forms are generated from photogrammetry processes, using photographs of human bodies to dictate their shape. I intend for the busts to be made to scale, no larger than one foot in width or length. The triangulation of the forms highlights the digital aspect of my work, where pattern and form are generated in virtual space. The triangulated surfaces also integrate another layer of pattern into the work. I have chosen concrete as the casting material for two main reasons: color/textural quality and material connotations. It is important to me that the busts are not visually obtrusive or distracting from the jewelry. The light grey color of the concrete will blend with the museum walls but still contrast in texture, allowing them to feel as if they are almost a part of the wall itself. My work is in greyscale with small additions of color and the light grey of the concrete will bring out the grey etchings in the jewelry, also provide a neutral contrasting backdrop. I also hope to harness the industrial nature of concrete as a solid, permanent and unmovable material. Its strength and durability contrasts with the fragility of the thin porcelain. The three remaining necklaces will be worn by live models who will sit as a part of the show for the opening. By placing the jewelry on “wearers” it gives the work real-life context, displaying it in a way that I would imagine it to exist outside of a museum, helping to bridge the gap between the work as art objects versus commodity. It gives viewers the opportunity to see the ways in which the pieces interact with the body: draping over curves, hanging with gravity and moving based on actual human gesture and posture. Additionally, it heightens the interest of the display, bringing it off of the wall. The models will be outfitted uniformly in dark grey linen dresses that I am sewing by hand. I enjoy the contrast between the natural warmth of the linen and the industrially white porcelain. The models will be seated on stools which will act as pedestals for the remainder of the show when they are not present.